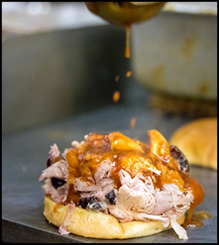 Johnny Ray's great tasting BBQ is a family favorite. Founded by Johnny Ray, a pioneer of the BBQ restaurant business in Birmingham, AL., our BBQ locations are fast casual restaurants in free standing, end-cap or inline buildings that provide in-store seating. With a history dating back to 1953, we have a strong brand recognition in the Birmingham area and are ready to expand. As any successful restaurant owner knows, Great Recipes are the key to return visitors. 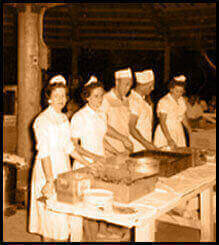 At Johnny Ray's BBQ, we are fortunate to have proven recipes that are know to satisfy any BBQ lover. How Johnny Ray’s Works for You! We can help you find just the right location for your restaurant. We supply equipment specifications for your size restaurant and help with layout design. Our consultants help train new employees and provide continuing training for existing staff. You do not have to possess experience in restaurant management. We work with you from the beginning to help assure your success. We help secure local newspaper coverage, and allow you to use our website to promote your location. Returning your franchise application does not obligate you in any way. It simply indicates your level of interest and allows us to review your qualifications. The visit will allow you to take a closer look at Johnny Ray’s restaurants and facilities. Plus you will have the opportunity to meet the key people who will be providing training and support. Prior to or during your visit, we will provide you with our disclosure document and franchise agreement. We will give you the opportunity to review these documents and have any further questions answered. Now you are in YOUR BUSINESS!